Our first relatively free weekend in Tokyo, we headed to the Inokashira Shizen Bunka-en (Inokashira Nature and Culture Park). Of course, we managed to choose the first really hot summer’s day of the year to do it – the temperature made it to 34 degrees! Inokashira Nature Park was perfect for Isaac. Most of the animals (apart from 62-year-old elephant Hanako) are small, and there are lots of bird and amphibian exhibits that the kids can get really close to. To get there we took the Yamanote line to Shinjuku and changed to the Chuo line local service heading for Kichijoji. Taking the Chuo line local service meant that the change was easy – we stepped off the Yamanote and onto the Chuo on the other side of the platform – no stairs, which is a real blessing in Japanese rail stations! The train trip was probably more exciting for Isaac than the zoo, as we boarded right at the front of the train behind the driver’s cabin and could see the express trains and the long distance train for Matsumoto zooming past. Every train is ‘Thomas’ to Isaac (apart from the shinkansen, which he calls planes), so he was busy calling out ‘hello Thomas’ ‘bai bai Thomas’. To get to the park from Kichijoji Station, follow signs out of station, then follow everyone else! This side of the station heads away from the very busy (and rightl so, Kichijoji is a shopping haven) shotengai (shopping street), past Marui and a bunch of restaurants, then very quickly leads to the far side of the park. Either go straight down the steps towards the lake, or if you have a buggy, detour to the left about 50 m for a ramp. The first part of the park with the lake is in fact not the zoo proper, but an annex. This is where the ducks and frogs are – very exciting for Isaac. And, to our pleasure, an ensemble was playing Okinawan music as we arrived. So nice. To get to the main zoo, either take the pedestrian bridge over the road, or walk along the street to the zebra crossing. 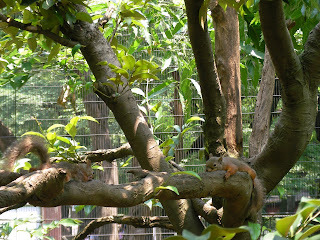 The zoo has lots of great areas for resting in the shade, lots of shops selling refreshments and a great range of smaller Asian and Eurasian animals, including raccoons, tanuki, foxes and badgers. Highlight for me was the Squirrel Street (an enclosed squirrel haven), although most of the squirrels looked like they were feeling the heat!